"The GDPR aims primarily to give control to citizens and residents over their personal data and to simplify the regulatory environment for international business by unifying the regulation within the EU." The main effect of the law that I've seen is that many web sites now have warnings that they are using cookies, and you have to accept the warning to make it disappear. Unfortunately, the GNUBG project decided that their best response to the new EU law was to temporarily shut down the site. Achim, one of the heads of the project, provided more details in a forum post that I pasted below. I certainly don't blame him or anyone for being afraid of potential consequences. Its just sad to see such a great program that took so many people so much work be almost inaccessible. We have a new GDPR (in Germany called DSGVO) adopted by the EU nearly two years ago, by Germany around one year ago, also a new Bundesdatenschutzgesetz. This law forces everybody saving and/or processing any kind of personal data to fulfil certain conditions starting with an understandable declaration about how and why data is preserved, processed, transferred and protected. This is valid for everybody apart from real personal web pages (family and cat pictures ;-) ). It concerns e.g. web page stats (ip-addressess), comments on articles (nick name, email address), even plugins from Wordpress or other CMS are concerned (google fonts, spam filters and so on). This law was actually adopted to protect users and customers from big companies like facebook. Unfortunately the German version of this EU law is squishy and vague at many points. Right now many bloggers, clubs, freelance, small companies, and NGOs are unsure and frightened in Germany. 1) Lawyers tend to categorise open source projects as non personal (fortunately we never allowed commercial banners or affiliates at gnubg.org). 2) The server is hosted in Germany, I’m responsible but don’t know yet whether a declaration should be written in German or English language. I also have no idea about the details of the CMS nucleus regarding the new law. 4) Here in Germany there is another pretty ugly law (Gesetz gegen den unlauteren Wettbewerb) which allows lawyers to write warnings combined with a fee when they notice a violation of the law. This already happened at the 25th of May in some cases and will definitely happen more often in future. Though gnubg is kind of a hobby project without any earning there are countless commercial competitors at the game market. I see some danger in this and don’t want to be the one being fined first. Google for »Abmahnanwalt« or Abmahnindustrie« and you know what I mean. So I decided to put the page temporarily offline until you (all the programmers) decide what to do. It’s actually much more complicated, but I’m lacking of time a little bit right now. For our weekly tournaments on Wednesdays we just print out our tournament brackets on a single sheet of paper. 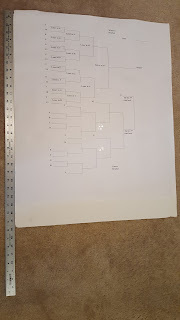 For our weekend tournaments where we play longer matches and normally have few more people, we like to make a larger bracket that we can display on an easel. For a long time, we would get foam board, I think 22" by 28", and draw a bracket on it. This was pretty time consuming since its tricky to make sure all the many lines are evenly spaced and straight and make everything fit just right. Lately, we've been instead printing out an enlarged version of the bracket that fits on to 4 pages. It seems like that should be easier to do than it was. And considering I only do it every many months, I'd forgotten how last time, so I thought I would document the procedure. I could not find any way to do it in Microsoft Word, so this solution is for PDF. If you're starting with a Microsoft Word document, as I do, then the first step is to save it as a PDF document. 1) If starting from Word, do a "Save as..." and save as PDF format. We then tape the 6 page print out to the foam board so that we can stand the foam board on the easel. When we write on the bracket with Sharpie marker, it can bleed through and get small dots on the foam board so I definitely wouldn't tape the bracket to the wall if you're using markers on it. Also, there are tiny margins on the paper when it prints, so we cut those off of at least one side of the papers so that we can tape them together with little to no white gap. When buying a backgammon board, the prices generally depend on the playing surfaces, and there are some personal preferences there. Here are some ideas for different options. Local department stores usually don't have anything but low quality boards, like chess/checkers/backgammon combo kits. those are cheap, like $20, but they're usually pretty small. They're also usually wood and wood isn't a great surface to play on. Some wood sets can be beautifully painted, but the loud sound of the dice hitting the wood can get irritating. And checkers slip more easily on wood. Specialty game stores may carry the standard "attache' " board that folds and has a handle. The price can be $30 to $100. The material of the boards they sell is usually felt with vinyl "pips" sewn on. Over time, the edges of the vinyl pips get worn and get in the way of moving the checkers. So these are good for a casual player, but will wear out fast for someone who plays regularly. Also in the $1000 range are leather playing surfaces. The leather can be beautifully painted and is a nice surface to play on too. One manufacturer of those is Brahma. There are some nice perks to these, like the ability to custom design them with different colors. Where is the best place to play online backgammon? The first is GridGammon. GridGammon is where the United States Backgammon Federation (USBGF) holds all of their online tournaments. Consequently, there are many top-level players who play there. As mentioned in other posts, GridGammon was derived from GamesGrid, which used to be one of the most popular places to play backgammon for money until playing for money became illegal in the US and GamesGrid was shut down. GridGammon does not allow playing for money, so all of the USBGF tournaments are free to enter. Registration is by invitation only, but the easy way to get an invitation is to sign up for a USBGF membership. GridGammon requires software that you can download for free, but unfortunately it only runs on Microsoft Windows as of now. If you don't want to join USBGF and/or can't play on Windows, then my next recommendation would be First Internet Backgammon Server (FIBS). FIBS is free and anyone can join. You just need to download one of many client programs. Different client programs have different features and interfaces, but they all connect to the same server. On Microsoft Windows, I would recommend Fibzilla. My third choice would be DailyGammon. With DailyGammon, instead of playing one live match all the way through at once, you play just a move at a time in many different matches. You make your move whenever is convenient for you during the day (or week) and your opponent makes their move whenever they get online next. So matches can drag on for weeks, but that's why people play dozens of matches at once. One of the nice things about it is that you don't have to commit to playing a whole match at once, you can just play a few moves in a few minutes if that's all you have time for. Another nice thing is that its all browser-based, so there is no special software to download. lost. In Open Doubles events, I don’t think we ever even got as far as the semifinals. all their finances, it doesn’t matter which one of us wins because we’ll share the prize money. (And when I say it doesn’t matter which one of us wins, I mean that strictly financially). doubles partners is splitting their winnings equally. (P - x) = amount paid to 2nd place. So in a Doubles tournament, the couple always takes home ½ of P.
There are a couple interesting corollaries to this proof too. up to the other partners. each couple will win exactly half the pot. Normally, when we have a tournament, we award the winner with club points equal to the number of players who attend. The next runner(s) up get half those points, the next gets half again, etc. Any player with a win gets some points and players with no wins get 0 points. This works well when we use a double elimination bracket, which we do when we have 5 or more players. Its common though towards the end of the year that we have less players, so sometimes we have a few nights of 3 or 4 players. On those nights, we do a round robin style tournament where each person plays each person once. The end result can have several ties and so its less clear how to award points. So finally, I documented each scenario and how many points we will award. Of course this can be applied to round robins in any sport with 3 or 4 teams, or other games, and the points can be multiplied or divided however desired. The goal is to try to award close to the same number of total points in each case that has the same number of players. In a 3 player round robin with no ties, the points are 3 for winner, 1.5 for second, 0 for third because that person has no wins. That's 4.5 total points. So when 3 players have a 3-way tie, each gets 1.5 points so that the total is again 4.5. That works out perfectly but 4 players is a little trickier. In a 4 player round robin with no ties, winner gets 4, second gets 2, third gets 1, fourth gets 0 (no wins). That's 7 points total. If we were to use a double elimination bracket for 4 players, which we do sometimes if we want to finish faster, then we end with a tie for 2nd. We don't make the winner of the consolation bracket play the loser of the main bracket, for the sake of time. In that case, we award 4 for winner, 2 each to the two players with 1 loss each, and 0 to the person with no wins. That's a total of 8 points. So the goal for the 4 player round robins where there are ties is to award either 7 points total or 8 points total, or somewhere in between. Our club has our regular meetings on weeknights. We like to play a double elimination bracket of 7 point matches in the main round and 5 in consolation whenever possible, but those can take several hours even with 4 to 8 people. Although we're all competitive and want the draw for the bracket to be fair and random, we also want to get home at a reasonable hour on a weeknight. Therefore, since weeknight tournaments are more casual and laid-back than a weekend tournament (and especially than an ABT tournament) we developed a couple modifications for our brackets to speed things up. First, we play "first available" in the consolation round. In other words, we don't use the "Loser goes to A", etc. designations of the bracket. If you lose in the first round, you're placed in the highest open spot of the consolation bracket. The big advantage of this is that as soon as two people have lost in the main round, they can start playing immediately. Using normal placement, the two first losers could be on opposite sides of the bracket and end up each sitting around waiting for the next loser on their side of the bracket. another advantage is that in cases of uneven players, like 7, the last person to lose will get a bye in the consolation round. So the slowest part of the bracket gets a little speed boost at that point. With "first available", there is much less sitting and waiting. The only disadvantage is that two people can end up playing each other a second time in the consolation round even before getting to the consolation final. That's not a big deal to us since most of us in the club have played each other countless times anyway. And even using the normal placements, people can meet up a second time in the consolation finals. One other trick we use is when we have 6 players. We use an 8 player bracket, but instead of using the "seed" placement numbers on the main bracket, we just place players in first top 6 slots of the bracket. That way all 6 players start playing immediately instead of 2 people on opposite sides of the bracket both getting byes and waiting. The side-effect is that for the players in the 5th and 6th spots, whoever wins will get a bye to the final. But that's really no extra advantage over normal placement. In both cases, there are 2 players who only need one win to get to finals. But with the modification, you play first and get a bye when you win. With regular placements, you get the bye first. the same concept can be applied to 12 players in a 16 player bracket too, just place them all in the first 12 spots so that you don't have FOUR people with byes sitting around waiting.